The 2014 DQSC 2000 Open was well supported by visiting sailors and club members alike. A report for this event was published in the Chichester Observer on Thursday 3rd July. See press cutting below. Report by Andrew Horne, with contributions from Rob Corfield and Peter King. Pictures by Chris Hatton. An additional report by Graham Dalton, from a competitors viewpoint, follows the press cutting. There were tricky conditions for racers and race officer alike at the annual DQSC open meeting for the 2000 class. A gentle breeze from the north was forecast to swing west, while any sea breeze would come from the south. In practice the fleet of 17, including 9 visitors found all three wind directions during the series of three races. Often all in the same race! For race two a slack tide and a shifty wind meant an early tack onto port and some very different tactics. The Daltons hit a large patch of weed to find themselves near the back of the fleet, and a big job to do to get back into contention. 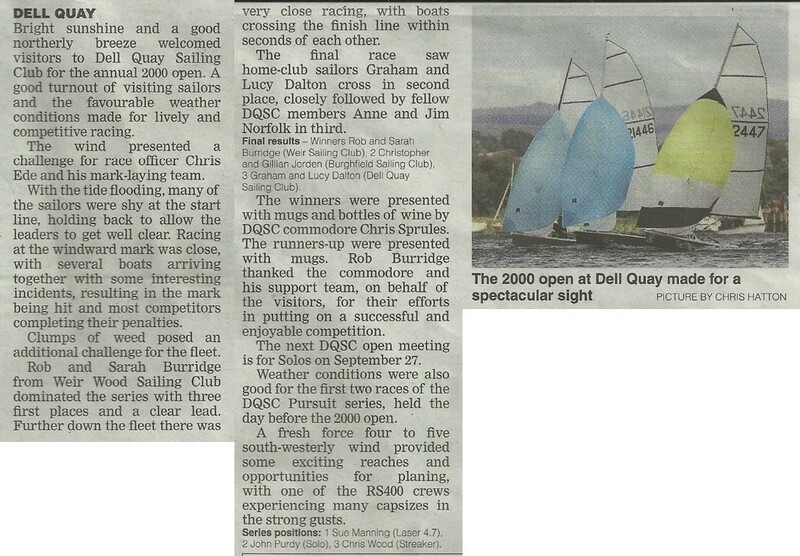 Dell Quay's Anne and Jim Norfolk sailing Toucan battled for places, as did local sailors Mike and Tim Dormer. But it was Chichester members Helen and Mark Green who fought off the attack to take 4th place behind another Burridge / Jordan / Dalton trio. The third and final race started against an ebb tide and a bit more west in the wind, leaving the windward shore a place for the brave. The Jordans went for the brave option, only to find little wind and lots of weed. This left the way open for the Daltons to take second and the Norfolks third behind another emphatic Burridge win. So some great racing in difficult conditions. But in the end it was the Wight boats who took the chocolates, leaving Toucan to seek solace in a Guinness in the after race bar.